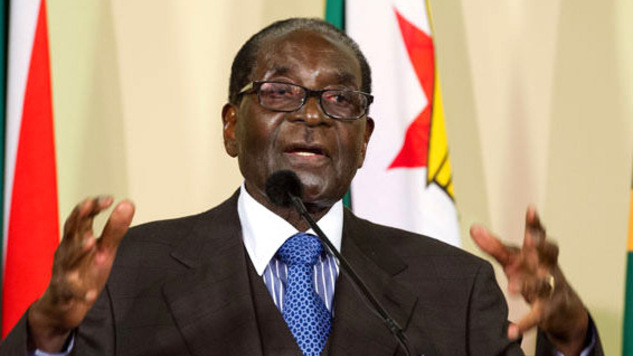 ZIMBABWE – NEW YORK—Zimbabwean President Robert Mugabe on Monday condemned the push for gay rights by “self-anointed prefects of our time” and decried Western sanctions, even as he extended an olive branch to the U.S. and other countries at loggerheads with Harare. “We are not gays,” President Mugabe declared in his address to the United Nations General Assembly in New York. “Respecting and upholding human rights is the obligation of all states and is enshrined in the United Nations charter. Nowhere does the charter arrogate the right to some to seat in judgement over others,” he said. Mr. Mugabe also reiterated long-standing calls by other leaders, especially from developing countries, for the reform of the United Nations Security Council and the General Assembly. ​He accused powerful countries of using bullying tactics to stifle change that has for years been demanded by especially developing nations. Africa is pressing for representation on the Security Council. “While the world has drastically changed since 1945, the United Nations and indeed the global governance architecture remains mired in a long by-gone era,” Mr. Mugabe added. Though he extended a hand of reconciliation with the West, Mr. Mugabe chided Washington and other Western countries for allegedly interfering in Zimbabwe’s internal affairs to achieve regime change. He said Zimbabwe was open to engage the international community and resolve the differences that they have with Harare. “We do not know what wrong we have committed against the United States of America,” he said. “We invite other countries with which we may have differences, including the U.S. and the NATO powers. Zimbabwean President Robert Mugabe signs a petition against Western economic sanctions targeting his supporters, in Harare, Wednesday, March, 2, 2011. Zimbabwe’s defiant president on Wednesday threatened to seize foreign businesses in retaliation for West. “We invite them if they have differences of whatever nature with us to eschew threats, pressures and punitive action in favor of reconciliation, friendship and dialogue. I therefore, denounce in the strongest terms the illegal sanctions imposed on my country by Europe and the USA. “Once more I put it on record that my country is desirous to live in harmony with all countries big or small. We have peace in Zimbabwe just now. We don’t want war, we don’t want interference; we don’t want to hear of regime change at all,” Mugabe added. United Nations Secretary General Ban Ki Moon had opened the session earlier, setting the tone for the need for World leaders to confront the various conflicts besetting the world. Ban cited the example of Syria where hundreds of thousands of people have been affected by the civil war that has sent many to flood Europe. United States President Barack Obama also called for world peace and did not pull any punches in blaming Russia for its intervention in Syria and Crimea. He mentioned Russia by name. Russian leader Vladimir Putin, who spoke an hour after Obama, differed sharply with the U.S. on the strategy to deal with Syria saying Al-Assad must stay put to preserve world peace. Chinese leader Xi Jinping announced that Beijing would contribute $1 billion of a new United Nations peace and development fund aimed at advancing peace and development. Xi also aid Beijing will provide an additional $100 million to the African Union to establish a standby force to respond to the continents emergencies. South African president Jacob Zuma rallied behind Iran’s bid to acquire a peaceful nuclear program and like several other African leaders, demanded reform of the U.N. Security Council.